What’s the scoop on oral cancer, and am I at risk? Q: I’ve been hearing a lot about oral cancer lately. What’s the scoop and am I at risk? A: Oral cancer kills one person every hour of every day and early detection is key. Our patients’ overall dental and oral health is top priority, and we do an oral cancer screening at each of their routine hygiene exams. This includes a visual examination of any irregularities in the gums, tongue, and palate as well as examination of the jaw bone through periodic x- rays. It is now recommended individuals (especially if you are at high risk including smokeless tobacco and HPV virus) perform a monthly self check. Checkyourmouth.org is a great resource on how to do a monthly at home check. Be sure and mention any questionable areas at your exam so we can thoroughly assess your concerns. Can nail biting cause long term damage? Q: My nine year old daughter is a nail-biter. Besides ruining her nails, is she causing long term damage to her teeth? A: Nail biting is a bad habit for several reasons. Children and adults who bite their nails can crack, chip or wear down their front teeth from the stress caused by biting. If your daughter wears braces, she is also putting herself at a greater risk of root resorption (which can lead to tooth loss) and of damaged gum tissue caused by torn, jagged or sharp fingernails coming into contact with gums. Nail biting is an unattractive and unhygienic habit that should be discouraged. There are over the counter products such as Mavala Stop that can be applied as a physical reminder when breaking the habit. Ask Dr. Beasley: Staying numb too long? I hate having dental work done because my mouth stays numb for a long time after a procedure. Is there another option? Local anesthesia is great for controlling discomfort during routine dental procedures, but there can also be lingering numbness that makes it difficult to eat, drink or speak. It is now possible to reverse these effects by administering a vasodilator after the procedure that shortens the duration of the anesthesia and returns patients to normal sensation much more quickly. The active ingredient in this product has been around since the 1950s, but has only recently been approved for dental procedures. It’s not recommended for young children. If prolonged numbness is a problem for you, talk to your dentist about your options. My children play several contact sports. What should I do if they ever have a tooth knocked out? Tongue and lip piercings may be popular, but can result in a long list of problems including gum and nerve damage, loss of taste, numbness and drooling. Eating or talking with jewelry in your mouth can chip or fracture tooth enamel, and constant irritation can result in oral ulcers. Since the tongue is covered with bacteria, infections and inflammation are common, and periodontitis can eventually occur (when the gum and bone pull away from the teeth and form pockets). Body piercers may be licensed or unlicensed, and may not adhere to good sterilization practices. Regular dental checkups are always important, but they are critical for people with oral piercings. Just what is plaque and tarter? Plaque and tarter are closely related and can easily be confused. Plaque is the colorless buildup of bacteria that begins sticking to your teeth four to twelve hours after every brushing. Foods, liquids and your own saliva contribute to this natural buildup. If plaque isn’t properly removed each day by brushing and flossing, it will harden and become tarter (also known as calculus). The only way to completely removed tarter and prevent periodontal disease is to have a thorough cleaning by a dental professional. Normally, this is done every six months at the time of your routine exam. For some individuals, this may not be often enough and your dentist may recommend more frequent cleanings to help prevent tarter deposits. Ask us how we can create a customized gum treatment for your mouth. Have you always wanted to have a brighter smile? Studies have found that whiter teeth can make you look younger and is the first feature that people notice. Teeth whitening is an easy solution to getting a more beautiful smile. If you have been waiting for the right time to whiten your teeth than there has never been a better time than now. From March through June, we will professionally whiten your teeth to raise money for seriously ill, disabled, and underprivileged children in their local communities and around the world. When you pay for your teeth whitening, you’ll write your check directly to the Smiles For Life Foundation, not to the dental practice. Fifty percent of the donations are earmarked for our practice’s local charity partner, The Oklahoma Dental Foundation, and the balance goes to the Smiles For Life Foundation to be distributed to worthy and approved children’s charities across the U.S., Canada and worldwide. Help those in need and receive a beautiful smile at the same time. It’s a win, win for everyone. No one wants to leave the first impression of having terrible breath. Just avoiding garlic and onions may not be enough to cure this foul smell. Knowing what can cause bad breath is the best way to get yours smelling like roses again. Oral bacteria is the usual culprit. Good oral hygiene habits go a long way in prevention of bad breath, also known clinically as halitosis. Make sure that you brush your gums and tongue in addition to your teeth. The use of a tongue scrapper greatly enhances bacteria removal on your tongue. If your doing everything right and still have a bad smell, there can be other medical causes. Sinus infections, post nasal drip, or certain stomach issues can also contribute to bad breath. Try adding these foods to your diet: Carrots or celery. The water in these veggies help clean teeth and can stimulate more saliva production. Apples can neutralize bacterial odors and parsley can counteract garlic smells. Try these drinks: Black coffee. Don’t add creamer or milk though which can add odors. Tea can help prevent the growth of certain bacteria. Water is excellent in neutralizing bad gases released from oral bacteria. In general the drier your mouth is the increased chance of having bad breath. Many people have anxiety over getting their teeth numb with a dental syringe. In fact 75% of adults say they experience some form of dental anxiety. Luckily, dental technology is always evolving. Now your anesthesia can be computerized! With the Dental Wand technology, you can have a more comfortable dental visit. Quit delaying treatment and get your smile back to healthy and beautiful. Another Great Reason to Quit Smoking- Healthy Teeth! Hopefully you know that smoking is bad for your health, but did you know it is just as bad for your oral health? 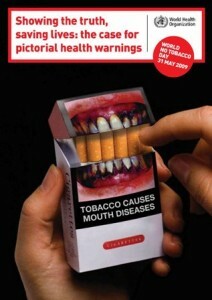 Tobacco use in any form is hazardous to your oral health. In addition to stained teeth, bad breath and a diminished sense of taste and smell, smoking also increases your risk of gum disease, one of the leading causes of tooth loss. It can cause receding gums, leaving the roots of the teeth exposed. This increases the risk of tooth decay and causes hot and cold sensitivity. Using tobacco products can slow down healing after extractions or other types of oral surgery. It greatly increases your risk for oral cancer, a disease that progresses rapidly and can be deadly if not diagnosed and treated early. Both cigarettes and smokeless tobacco contain dangerous chemicals… 28 different cancer- causing chemicals have been identified in smokeless tobacco products.